If you are at any bus stop on Central Avenue, you can now use ABQ RIDE’s TXT2RIDE to find out when your next two buses are scheduled to arrive. It’s the same service that is available for all Rapid Ride stops. The 168 stops on Central Avenue as well as the 58 Rapid Ride stops in Albuquerque now feature a round, plastic puck with a unique, blue-colored number identifying the location of the bus stop. The puck has a raised, four-digit number attached to the bus stop pole four to five feet above the ground, with most pucks facing the sidewalk. 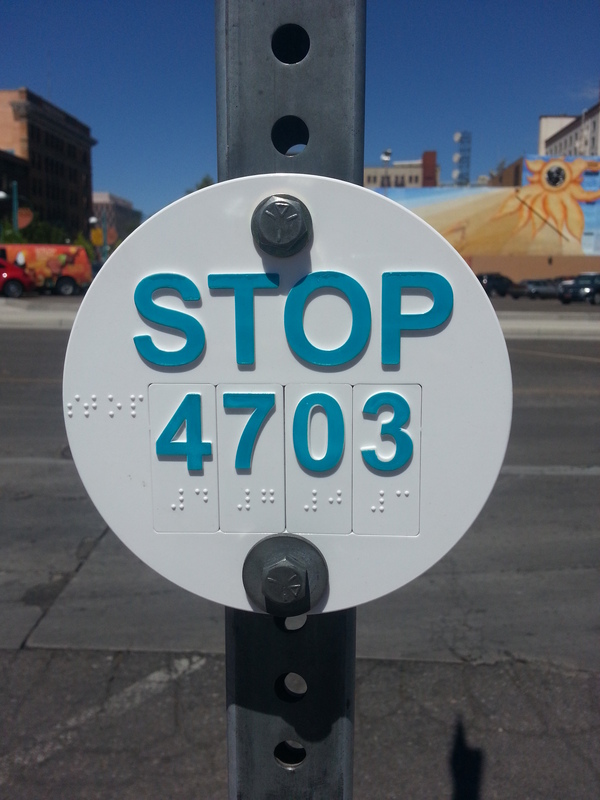 The bus stop number is also provided in Type II Braille below the tactile number. To use TXT2RIDE (TEXT 2-7433), you simply text your bus stop puck number, a space, and the number of your bus route to 2-7433. In as little as 15 seconds, you’ll get a text back with your next two, scheduled buses. If the bus stop serves more than one bus route, you’ll need to compose a separate text message for each route. ABQ RIDE doesn’t charge a fee to use the TXT2RIDE service. Normal text messaging rates apply according to your mobile phone service provider and text message plan. ABQ RIDE can also use the TXT2RIDE system to send notices (such as schedule disruptions or routes experiencing delays). Of course, if you have a smartphone, you can use the ABQ RIDE App tell you where your bus is, within about 30 seconds’ accuracy. It also features bus schedules, fares, ABQ RIDE’s website, related websites such as the N.M. Rail Runner and any special alerts regarding the Transit Department/ABQ RIDE. To get a free download of the ABQ RIDE App for your iPhone, iPad, iPod Touch or Android phone, Click HERE. “With TXT2RIDE, our riders have unprecedented, quick access to updated information on schedules, bus locations, even alerts,” said Bruce Rizzieri, Director of ABQ RIDE.